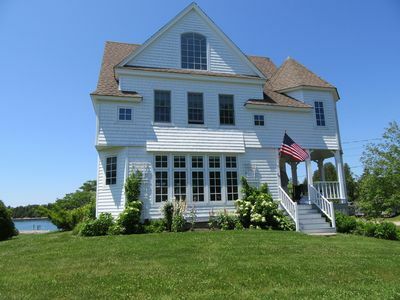 The Dunn House is a beautifully restored and updated antique Maine coast home located on the 53 acre Hubbard Point Trust, a private nature preserve located on Westport Island, Maine. 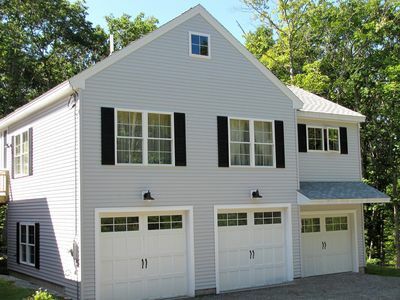 The house is located on the western shore of the property and overlooks Hockomock Bay. 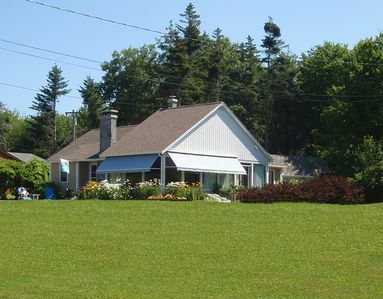 The preserve is also home to our other house, the DAL house, which is located on the eastern side of the property, and sits right on Heal Cove. 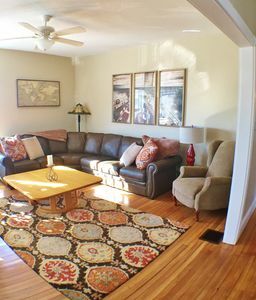 We offer the unique opportunity for larger groups to rent both houses. The houses are far enough apart to offer true privacy and seclusion yet only a short walk (.2 mile) down the driveway to visit one another. 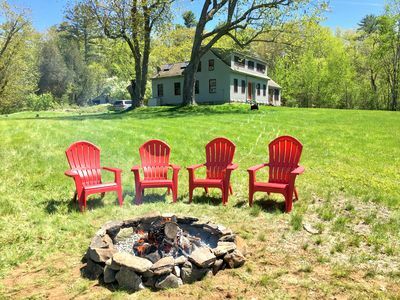 A perfect spot for extended family, friends, reunions or a small gathering. The two houses combined, sleep 14 with a several sleeping options. The DAL House- homeaway.com listing #3878870. 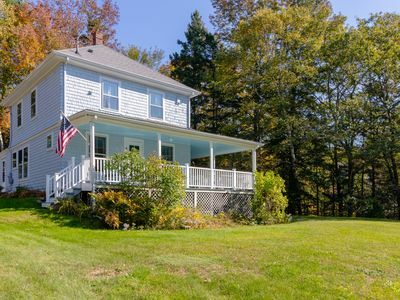 The Dunn House is an antique Maine home that has been lovingly restored and updated to be a well equipped and comfortable family home. 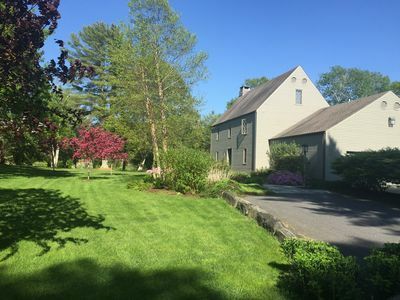 Historical paint colors, onion lamps, wide plank pine floors, bead board paneling, a spiral staircase, stone fireplace and built-ins all add to the historical charm of this home. The feel of a traditional, old coast home has been preserved while we have payed attention to the needs of the modern world. An HDTV Smart TV with satellite connection and wireless internet will keep you connected to the outside world, if you wish. A whole house, multi zoned, baseboard hot water heat system and window air conditioners for the bedrooms keep you comfortable in any season. A whole house water filtration and reverse osmosis filtration system in the kitchen sink and refrigerator ice maker insure sparkling clear well water. There is also a home security system with a direct dial for fire and 911 emergencies. All the amenities and needs have been thought of for an enjoyable stay. 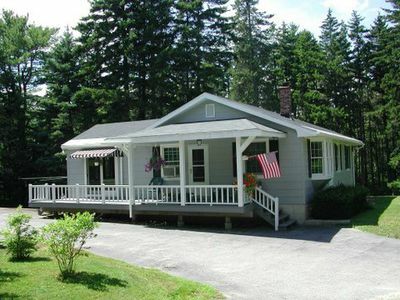 Relax in the sunroom surrounded by the views of Hockomock Bay, the sweeping lawns and the Maine forest. Enjoy your coffee as the morning sun peeks through the tall pines while you watch the loon sun themselves on the rocks in the bay. Open the windows and feel the cool shore breezes blow in while you relax in the recliner and read a good book. The large room is perfect for relaxing, meditation, yoga or birdwatching. If the weather is chilly you can light the gas stove, sit around the coffee table and play games while enjoying an incredible sunset. 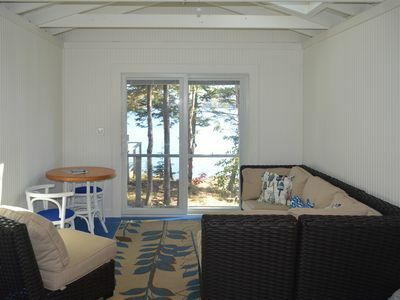 Cook up a Maine lobster dinner in the well equipped, cooks kitchen while the sun shimmers over the bay. The kitchen and dining room are the perfect place for your group to gather after a day of Maine fun. A gas range, dishwasher, RO water filtration system, coffee maker and grinder, toaster, Henkel knives, ice cream maker, waffle iron and lobster pot are all the tools you will need for your gourmet meal. Spices and basic pantry supplies are also there for your convenience. There is a gas grill located outside. Stay connected in the library with wi-fi, and a 50' flat screen smart tv with satellite and access to Netflix and other apps. Go low tech and enjoy one of the many books or magazines in our library or play a game or puzzle from our large assortment. We also have a small ping pong table and a dart board for more fun. On a chilly night, enjoy a crackling fire in the stone fireplace. Three bedrooms are located on the second floor. 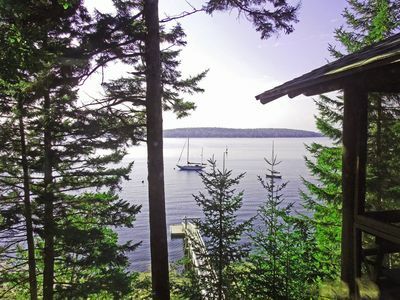 The master, with it’s beautiful view of the yard and the bay, has a queen bed and a tv with satellite reception. The second bedroom has two twin beds that can also be converted to a king with a wedge, mattress topper and all needed bedding. This bedroom also has a tv and a beautiful view of the yard and bay. Sleep under the stars in the third bedroom. The beautiful arched widow and the four skylights make this room a special place to spend your night. It has two twin beds and can be accessed through the other bedroom or by the spiral staircase. We provide bedding and all the bedrooms have LL BEAN comforters and extra blankets and pillows. There is also a queen sleeper sofa in the first floor library. The bathroom is on the first floor and there you will find an ample supply of towels and a hair dryer. A washer and dryer are in the basement and a ironing board, iron and starch are also available or you to use. 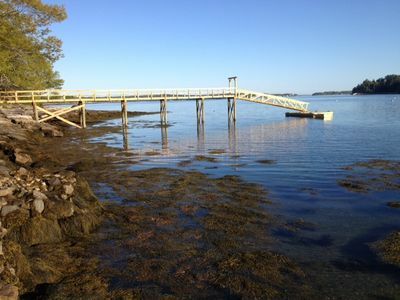 Westport island is conveniently located on Maine’s mid-coast and accessible by bridge. 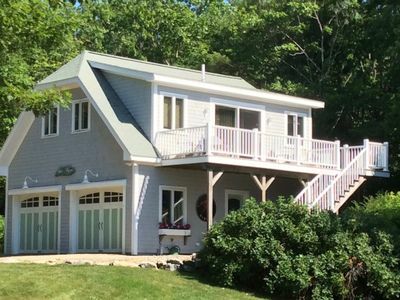 A quiet non-touristy island that is a perfect get away from the congestion of Route 1, yet a close drive to attractions, beaches, restaurants, shopping and antiquing. 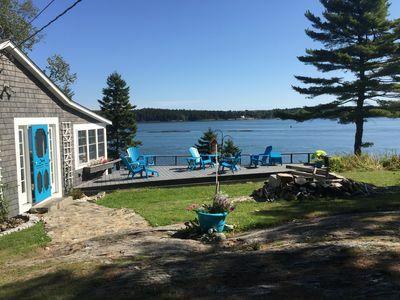 The Island is the perfect jumping off point to visit Wiscasset, Booth Bay Harbor, Bath, Damariscotta, Freeport, and Rockland. Westport's winding rural roads are perfect for a long scenic walk, bike ride or run. Just a short drive from the house you can enjoy hiking on one of the islands public preserves or launch your boat at the public boat dock. If you get hungry, pick up a lobster on the island at the NorthEnd lobster Co-op or head over to the Squire Tarbox Inn/Restaurant and organic farm for a delicious farm-to-table dinner or Monday night pizza! Just a short drive from the island and you will be on the scenic Route 1 where you will find Shaw's grocery store, restaurants, antiquing, canoe/kayak rentals, a ropes/zipline/gorilla laser tag park, and gas stations. Head North on Route 1 and you will find yourself in “the prettiest village in Maine”, Wiscasset. Walk along the water front, enjoy a lobster dinner on the dock, eat at the famous Red’s or explore one of the many antique shops. A little farther north and you can take a turn and head to Boothbay or Damariscotta. Both coastal towns are known for their shopping, dining, and antiquing. Boat tours for whale/seal watching and sailing or fishing adventures can be taken from both locations. 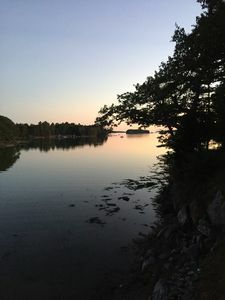 Boothbay is also home to the Coastal Maine Botanical Gardens, a stunning display of Maines natural coastal landscapes enjoyed by adults and children. The children’s garden is a magical place to explore. 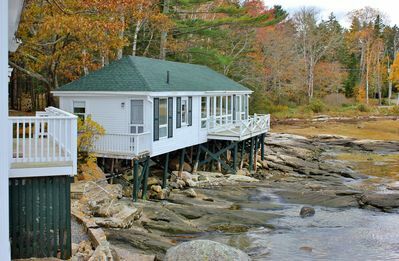 Pemaquid Point Light house and beach is a short drive form Damriscotta. A short drive on Route 1 and you will cross the Kennebec river to head into Bath, “the city of ships”. Great dining and shopping along with the Maine Maritime Museum can be found in this waterfront town. Don’t forget to pick up some local Maine produce at the waterfront farmers market which runs year round. 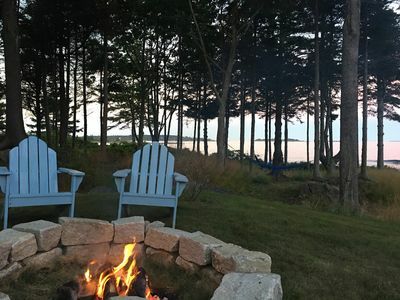 Not far from Westport you will find two beautiful Maine beaches. Reid State park’s sandy beaches, tidal pond, and bath house is the perfect place to cool off on a warm summer day. Popham Beach is a “must see” in Maine. One of the most beautiful parks in Maine!!! This is where Maine keeps all it’s sand! Miles of beach, tidal rivers, and and island(at low tide) to explore. Surf, boogie board, kite sail, paddle board, swim, relax or beach comb. There is something for everyone at this stunning beach. Walk to the island at low tide or swim in the warm waters of this beach. While only renting through Homeaway since the fall of 2014, our reviews speak for themselves. 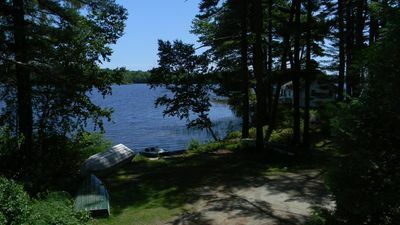 We have had wonderful guests who have enjoyed our beautiful family home and acres of private land on the mid-coast of Maine. 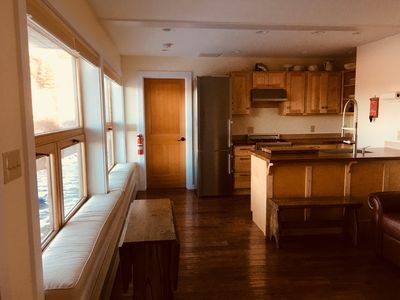 Our renters have enjoyed the secluded property while being close enough to explore from Portland to Camden and all of the great stops in between that the mid-coast has to offer. We have made sure to provide every amenity to make your stay comfortable, relaxing and fun. We are always here to help you plan your trip to the mid coast and are extremely attentive to your questions and needs. 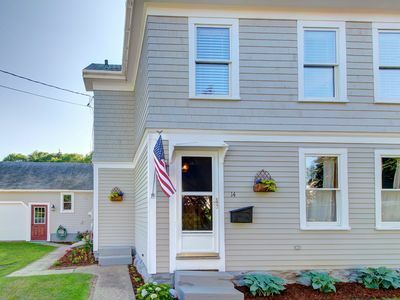 Classic and dog-friendly house w/grassy yard, near area shopping! 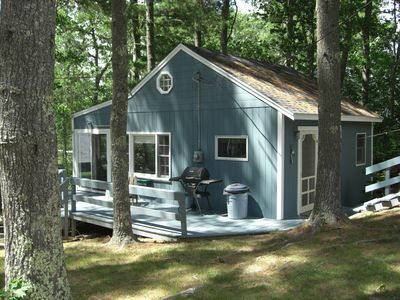 Damariscotta Lake Cottage Nobleboro two bedroom one bath house. 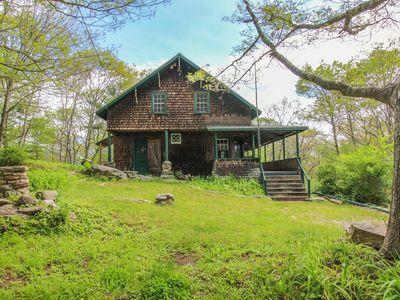 Century-old oceanfront home w/ wrap-around porch - walk downtown, dogs OK!